Vacant hospitals have been much in the news in Chicago lately. Plenty of coverage has been given to the battles over saving Northwestern University’s Prentice Women’s Hospital and over what will happen at Children’s Memorial Hospital’s former site in Lincoln Park. 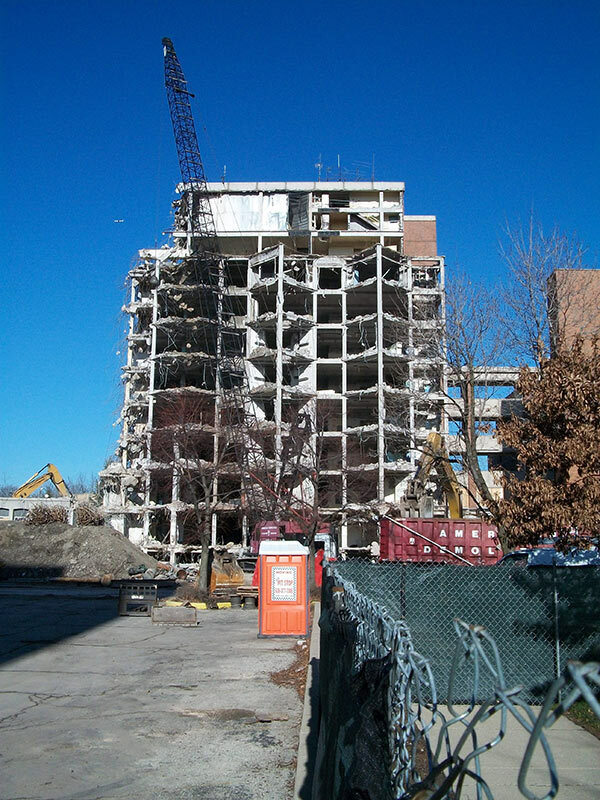 Other closed medical centers in Chicago have also been noteworthy, including the old Cook County Hospital building and the architecturally distinctive Michael Reese Hospital campus, which was demolished partly in connection with the city’s abortive bid to host the 2016 Olympics. But the process of reusing these vacant places of healing doesn’t always hit the front pages, and sometimes the reasons why a hospital sits empty for years upon years can be obscure. Two such hospitals on Chicago’s North Side—Ravenswood Hospital and Edgewater Medical Center—tell very different stories. As one finally nears redevelopment, the other stands as a multi-story eyesore in an otherwise solid residential setting. Their histories highlight some of the redevelopment issues that seem to be characteristic of the phenomenon. Ravenswood was founded in 1907. By the early 1990s it was sizable, especially for a community hospital—more than 450 beds, a nursing school with a 12-story student residence, a six-story ambulatory-care unit, as well as psychiatric, trauma, rehab, oncology, and coronary-care units, all on a 7.5-acre campus. But around that time Ravenswood started to encounter financial problems, and in 1998 Advocate Health Care bought the business. Despite what reportedly were multiple promises by management to keep Ravenswood open, Advocate began to consolidate the hospital’s services, physicians, and patients at its other facilities. After years of losing money, Ravenswood was closed in early 2002 and soon after was sold to developers. Over time, various buildings on the campus migrated in new directions. 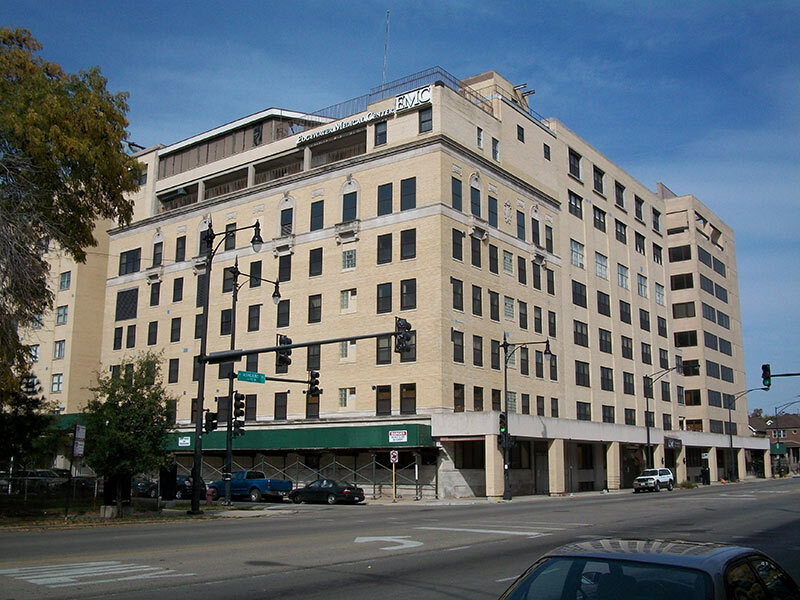 A medical office building at the site’s northwest corner, at Damen and Wilson avenues, became a stand-alone medical professional building, and the former student residence for the nursing school became an apartment building. Both are currently owned by Brijus Properties, Chicago. A hospital tower at the southeast corner of the site reportedly was in use until about a year ago, but is now vacant again. The L-shaped main hospital complex itself—the eight-story Adler Pavilion and an adjoining five-story wing—remained vacant all along. Enter the Lycée Français de Chicago, a non-profit, bilingual school serving grades K-12. Since its founding in 1995, the Lycée outgrew its campus near Chicago’s lakefront. So the school bought the 3.8 acres occupied by the main Ravenswood buildings and developed a new campus. Chicago-based development consultancy Project Management Advisors (PMA) was brought in around February 2011. The Ravenswood site was not zoned for educational uses, so the Lycée had to re-entitle the property. PMA finished the rezoning, developed concept-level plans and worked up a budget, which is currently about $32 million. Of that, $2.4 million is budgeted for demolition of the two buildings the Lycée bought. Chad Matesi, senior project manager at PMA, called demolition “one of the challenges of the site” and explains that “the demolition costs are big” in part because of asbestos abatement, which began last August. Another issue, he said, is that because the buildings adjacent to the Lycée’s site were originally developed as part of an overall campus, they share utilities and walls. The building at the site’s southeast corner was added to the five-story wing, so it has no exterior wall on its north side. As the wing is demolished, new exterior cladding will be added to the corner building so its interior is not left open to the weather. 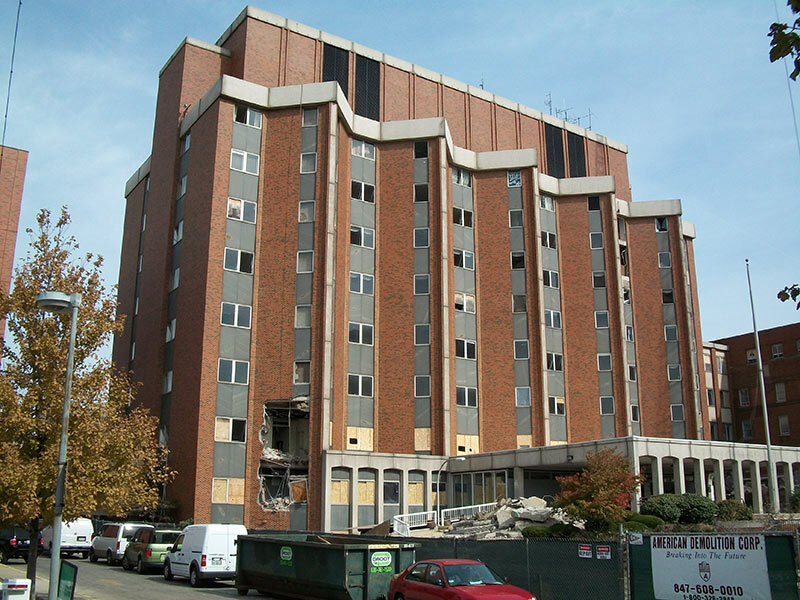 Despite those complications, demolition is on track to wrap up this spring. Construction on the new school, which will total about 85,000 square feet and sit slightly north of the buildings it replaces, will start in January 2014. It is slated to be finished in March 2015, with the school opening that fall. About a mile and a half north of the Ravenswood campus sits the hulking Edgewater Medical Center. Its story has yet to find a happy ending, and in fact the hospital’s recent history is downright sordid. Local physician Maurice Mazel founded Edgewater in 1929. He, and later his widow, ran the hospital through the 1980s. In 1989, however, a businessman named Peter Rogan bought the nearly bankrupt medical center, reportedly for $1 million in cash and the assumption of $10 million in liabilities. Rogan’s reign brought a stunning increase in revenues, but through unsavory means. A January 2003 announcement by the U.S. Attorney for the Northern District of Illinois stated that over a six-year period, Edgewater physicians had committed “pervasive fraud,” lying to patients about their need for hospitalization, admitting patients without cause, and performing medically unnecessary procedures, in the process killing two patients. The hospital was closed in December 2001 and many of its physicians and executives faced legal action. Since then the campus has been dormant, with the exception of a former parking lot along Rosehill Drive, just north of the building, which was redeveloped with single-family homes in 2003. The remainder of the property is stuck in a seemingly endless political and financial impasse. Neighborhood residents want a park on all or part of the property, with single-family residential (the site’s original zoning) at most, though senior housing was suggested at one point for the existing buildings. Developer Waveland Partners would like to build a 13-story, 230-unit apartment tower, a 1-acre park and 19 single-family homes. Dexia wants the reported $6-8 million in available TIF funding to demolish the property. Meanwhile, the hospital’s basement has been flooded for years, its masonry is gradually deteriorating, its windows are broken, and its entrances are unsecured. Fees to the hospital’s bankruptcy attorneys have stacked up into the millions, with no end in sight. A 2010 appraisal estimated Edgewater’s value at only $5.3 million, minus demolition costs. At the most macro level, said Cornelia Hodgson, principal of C.C. Hodgson Architectural Group, a practice that specializes in healthcare and senior living, independent community hospitals are victims of a movement toward larger healthcare systems. Beyond that, she said, the basic design philosophy of healthcare settings has evolved enormously since many older hospitals were built. Hospitals are now designed to be more patient-centered, not doctor- or nurse-centered. “The entire ambience of the building,” from more-natural lighting to barrier-free access and clear navigation, is more in line with hospitality design. Older hospitals might not have spaces for current imaging and treatment technologies and might lack the ability to ceiling-mount certain equipment, adequate radiation shielding and sound insulation, and floors with enough weight-bearing capacity. Hodgson adds that standards for HVAC energy efficiency, and especially for air changes and filtration, are tighter now. As for adaptive reuse, Hodgson said there are usually too many plumbing chases for office or even multi-family occupancies. 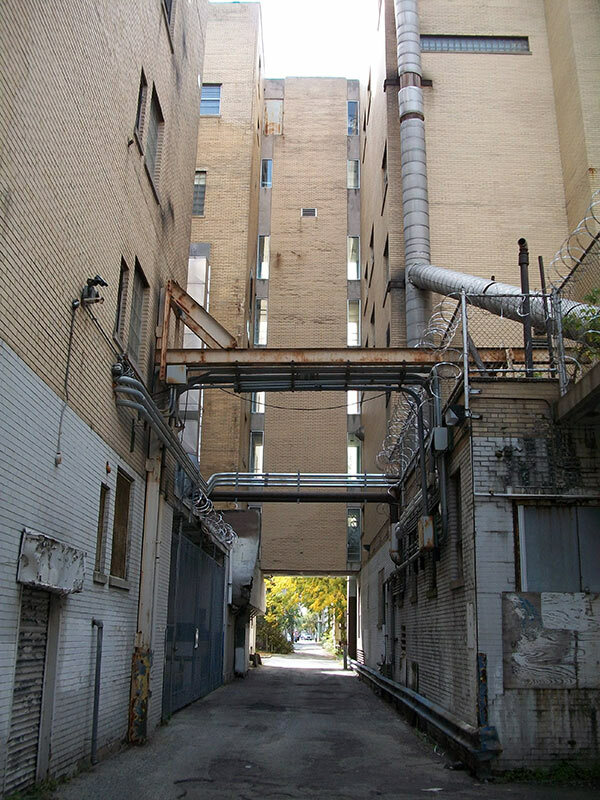 Worse, the typical distance from a major corridor to the parallel exterior wall is often easily 10 feet or more shy of what would be needed for multi-family reuse. 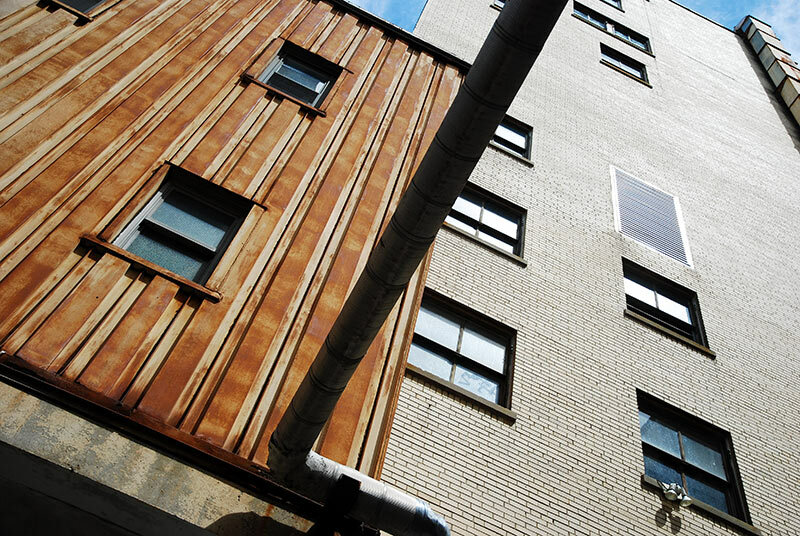 Nonetheless, a few specific adaptive reuse options for older hospitals do exist, Hodgson said. She knows of a hospital in Cleveland that was converted into a nursing home about 10 years ago, and a conversion into assisted living is another possibility. 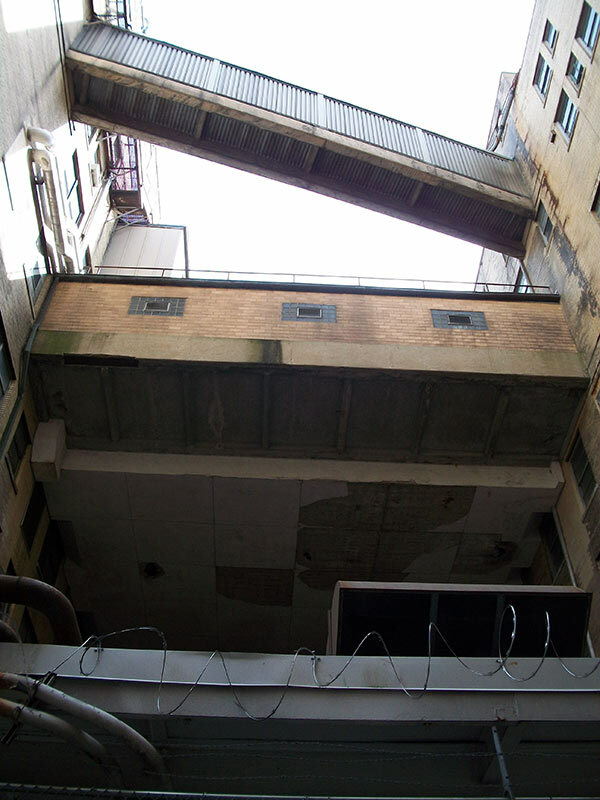 Regardless, the odds against Edgewater being reused loom large as the hospital sits exposed through yet another season.